Unfortunately, this board dedicated to the Yamaha DGX Grand Piano series has not been very active lately. The fact that some time ago, someone inadvertently erased most of the old posts is the Forum didn’t help, because since then, this sub-section of the Forum is practically empty, which doesn’t attract new DGX users looking for some information about their keyboard. So I decided to post here a video I just found on YouTube, with a very nice presentation of the DGX 660 At Swetwater, showing off a fraction of the things you can achieve with this very nice keyboard. Apart from the Piano Room and the microphone input features, everything in this video is also pertaining to the DGX 650. In the video, you’ll find an interesting explanation on the way the Yamaha ChordTracker app can be used with the DGX keyboards, or with any recent Yamaha recent arranger keyboard (with the exception of the rather basic PSR E263, which has no USB connector). Comments are very welcome, as would be any suggestions as to revive this section of the forum. I own a DGX660 and wonder why there is no more interest on it. It has plenty of possibilities, with nice voices and styles. Of course it is not as cheap as the PSR-E series but on its price range there is nothing similar, IMHO. who wanted a little extra fluff on the machine. own several arrangers don't fool around much with the style backings offered. Have lurked a few times to Piano World Forum and sometimes the dgx's are discussed,, in the digital piano threads. players or to those desiring to learn the instrument. Hi, Elaine. While it is certainly true that this is "PSR Tutorial" and is designed (mainly) for arrangers, the DGX series (and some of the E series) do act, in some sense, like arrangers. Granted, they are not PSRs or PSRSs, but they do allow for limited multi-track recording and having user style files and voices. Plus, as been said, they have 88 fully weighted keys, something most pianists insist on or appreciate. Truth be told (and this is just me), I'm an old guy and I don't have much use for all of the newer DJ, House, Funk, or Rap styles that seem to take up most of the styles since Yamaha went to the PSR-S series. I loved the styles in my old PSR-730 and PSR-740, even if the disk drive was a pain in the neck. So, more than likely, I will be downloading some old PSR styles to supplement what my DGX-660 already has in it. The nice thing, at least for me, is that I can still record my songs to .wav and change it to an .mp3 for sharing. I don't need all of the voice and style tweaking that the PSR-Ss and Tyros can do. Awesome, these keyboards are -- for arrangers. But too many bells and whistles for me. I just like to select a style and start playing. I hope that though this is "PSR Tutorial", we can keep this section open and fun. Even for "PSR People" (ha ha), the goal is, ultimately, make music and to enjoy it with others. Unless bandwidth is a big problem, I would hope that non-PSRs can still have a home here. I can’t agree more with you on this subject. 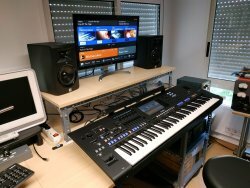 The DGX line of keyboards are nice digital pianos, with some basic arranging capabilities, and I personally think they deserve their place here - this is why this forum section was created. If you want to share any question, appreciation or information on your DGX, what you like and dislike, what you are using it for, etc., it’ll be more than welcome. Vinciane, we each have our own histories with our keyboards. I cut my "arranger teeth" on an old PSR730. Years ago, I often played it at church to provide backing tracks to the grand piano I also played. That was an awesome keyboard for its time. It sounded great and was, of course, portable. I've had a number of other PSRs since then and I've enjoyed them all. To me, the feature of using a USB stick to record .wav was a true breakthrough. But times have changed for me, so my needs have changed. I don't play out in public anymore, so I don't really need something portable. I wouldn't consider the DGX660 to be portable anyway, even if it is marketed as a Portable Grand. Too heavy. That is the cost of having 88 fully weighted (or close to it) keys. Coming from a piano background, the organ keys of the PSRs always felt a bit toyish to me. But they (the PSRs) are not digital pianos, they are portable keyboards, and they serve exceptional well in that capacity. Of course, over time Yamaha has introduced 76-key versions. Maybe they even have an arranger now with weighted keys, I don't know. Right now, I just have a P115 digital piano. It is lovely for what it is. Great sound, good feel. But when I play something on it, my mind often says, "Wouldn't a Rhumba behind this sound great?" Or, "Gosh, I wish I had a 16-beat Ballad behind this." And that is why I've ordered a DGX660. It should be here this coming Tuesday, Oct 23. I'm excited, as you can probably tell. Again, I'm NOT trashing any other keyboard - far from it. Yamaha, IMO, makes great everything. But their piano sounds, even coming from a PSR or TYROS with decent speakers are, like my P115, phenomenal, as close to having a grand piano in your house as you can get - at a fraction of the price and space for the "real thing." And, I hope, the Piano Room option on the DGX660 will make that just a bit better as you can change the ambience, reverb, chorus, and even the "lid position" at the touch of a button. I probably won't play out anymore. Carpel tunnel and arthritis are setting in. But I will hold onto playing piano as long as I possibly can. I'm almost 60 and it has always been a part of my life, even a spiritual outlet. So I'm hoping I can enjoy this DGX660 into my twilight years, as long as possible.